I don't remembers studying the Maya, the Inca or the Aztecs as a student. I have discovered that most of my colleagues don't either. The civilizations are fascinating. 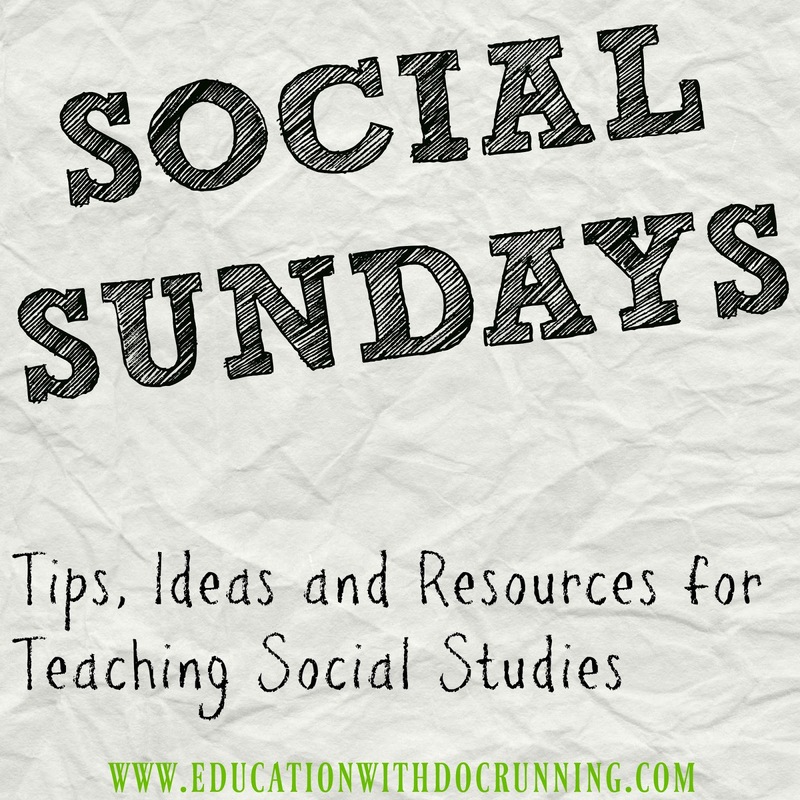 So, if you have to teach a subject you may or may not have ever learned about where do you start and what do you include. 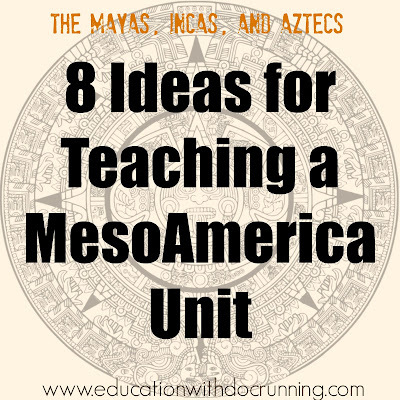 I recently helped a teacher brand new to teaching a MesoAmerica Unit with just that and thought I'd share 8 of my favorite resources and activities to include in a unit on the Maya, the Aztecs and the Inca. to make connections between the cultures and other civilizations as well as today. 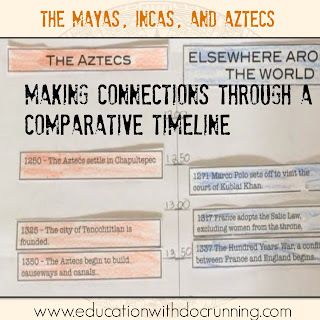 Getting oriented to the MesoAmerica civilizations: The Maya are the oldest of the three civilizations, but before we even start with them, we look at the geography of the three civilizations. We investigate what countries are there now and discuss what we know about that area of the world. Students start to think about the climate and geographical features that will shape the de elopement of civilizations. What are the benefits and challenges of mountain ranges such as the Andes? What resources does the rain forest provide? I use interactive notebook pages for this part. codex tends to be a hit with students, we start with the station activities. 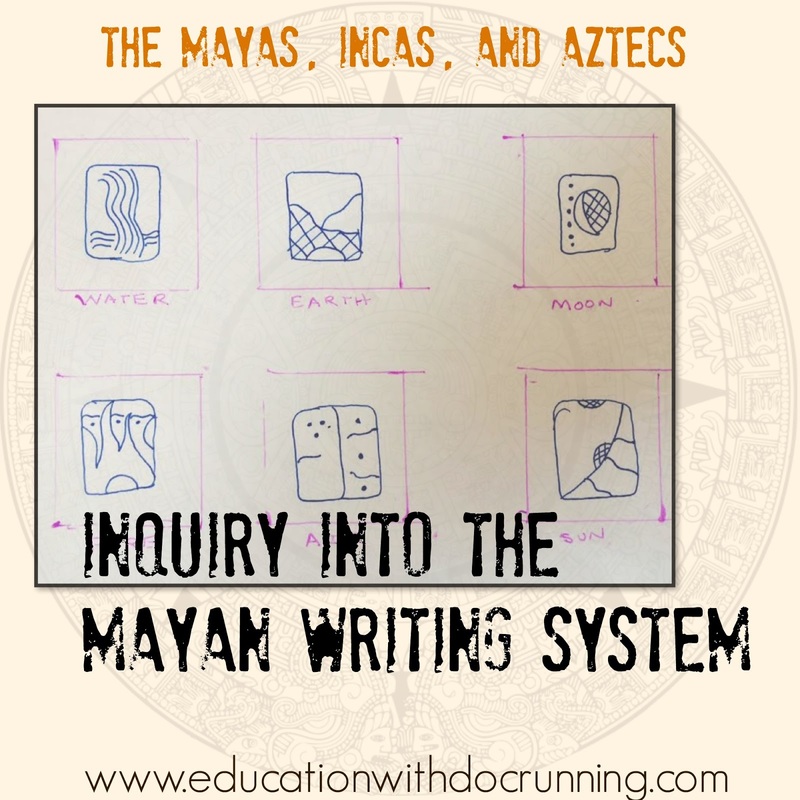 Students use a combination of informational text and hands-on activities to explore the writing system of the Maya. Students complete 2 of the 4 activities: write in glyphs, create a codex, make a stela, and develop a pictograph system. 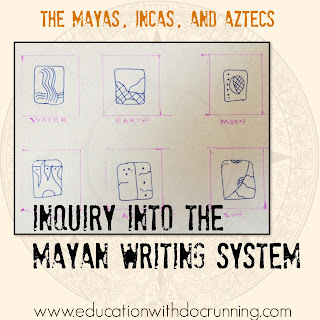 At this point students are making connections between the glyph system of the Maya and that of Ancient Egypt but also discovering several differences. 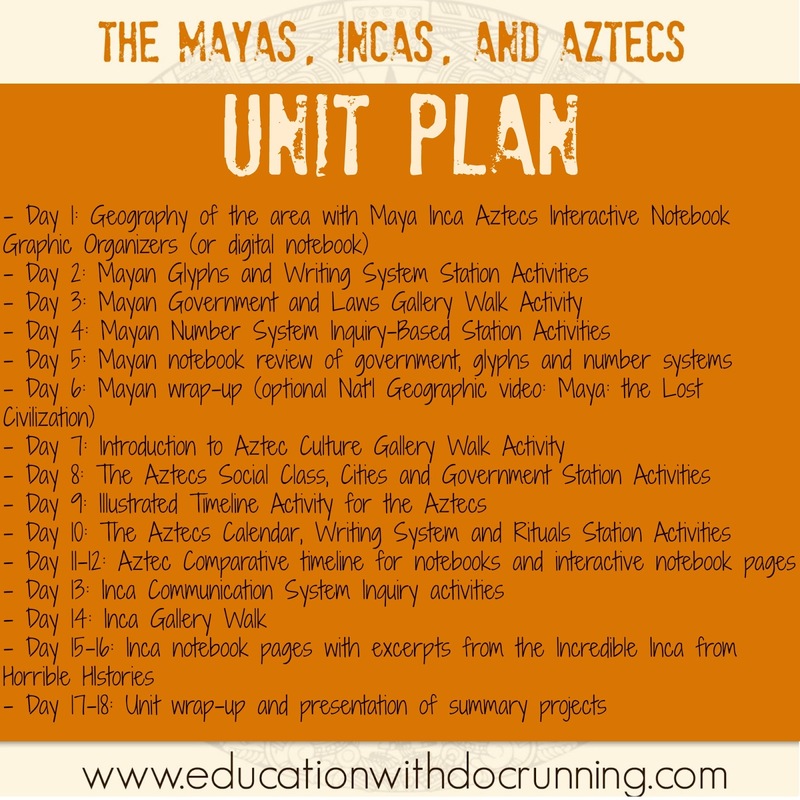 The Mayan law of the land: For the government and laws of the Maya, I switch things up and put students in charge of their learning. They work collaboratively to create gallery walk displays on aspects of the government and the legal system and then go on the gallery walk (you can learn more about using gallery walks here). It's nice for students to take a break from stations and to work with each other. Also, they do much better work when they have an audience beyond just me. The government is important as we will be comparing it to that of the other civilizations and modern times, so I want to make sure students take time to explore, understand and analyze it. 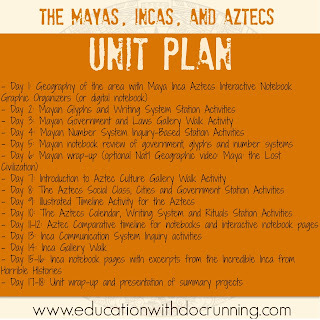 The structure of the Aztecs: We do additional activities with the Maya, and then we begin to focus on the Aztecs. I set up four station activities related to the social class and government structure of the Aztecs. As with the Mayan writing system, students can choose from the stations. I do require that all students complete the social structure pyramid activity. 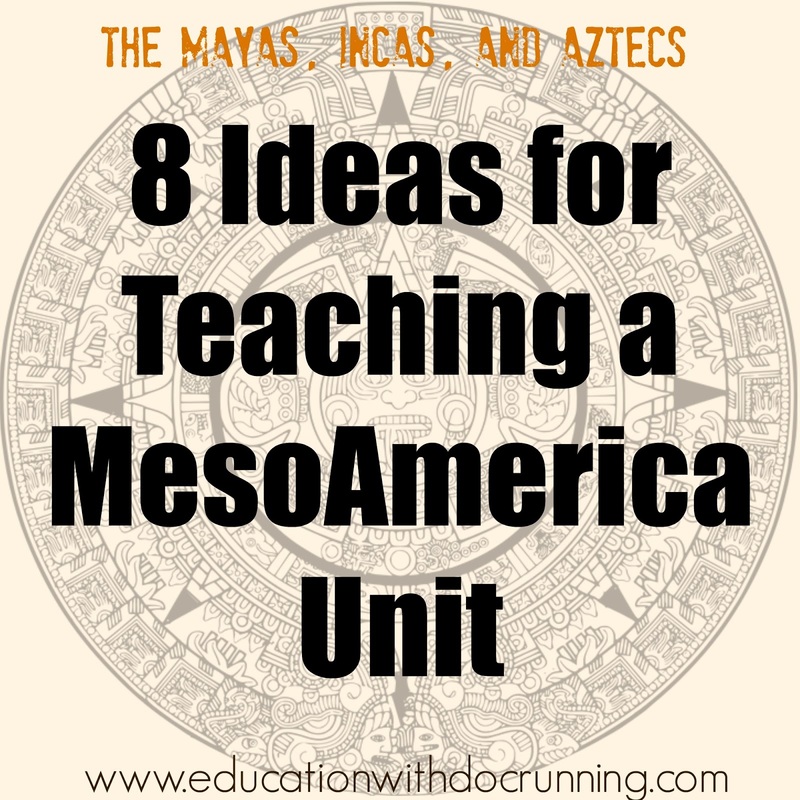 At this point students are making connections between the hierarchy of social class in the Aztecs as well as with the Maya, and Ancient Egypt and other monarchy governments. comparative timelines. 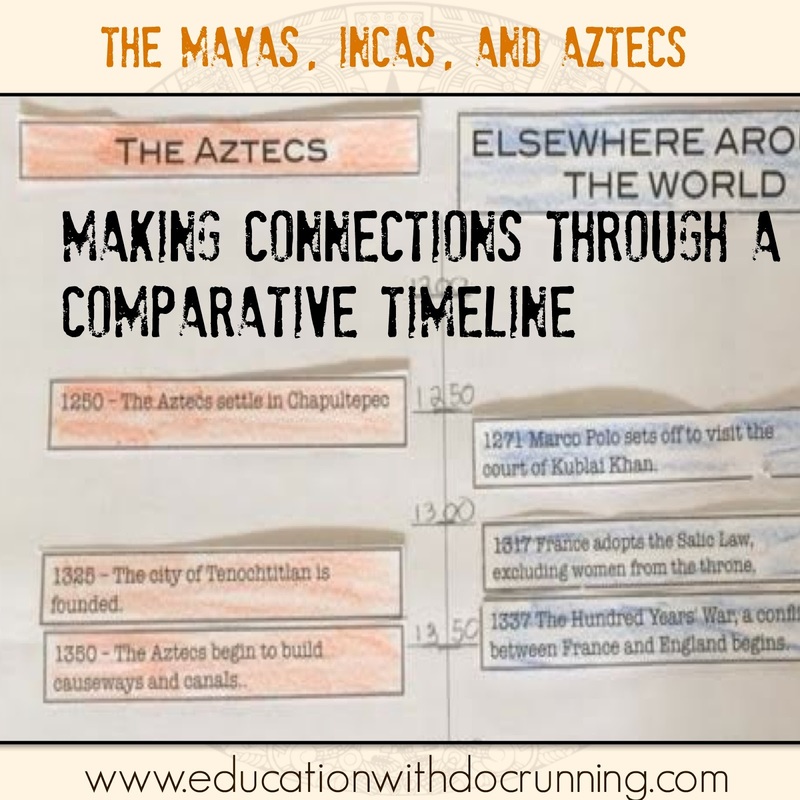 The timeline places Aztec events on one side of the timeline and events happening in other places in the world on the opposite side. Students are often surprised to discover that while the Aztecs were around, Marco Polo was traveling the Silk Road and later Leonardo DaVinci was completing some of his most well-known masterpieces. 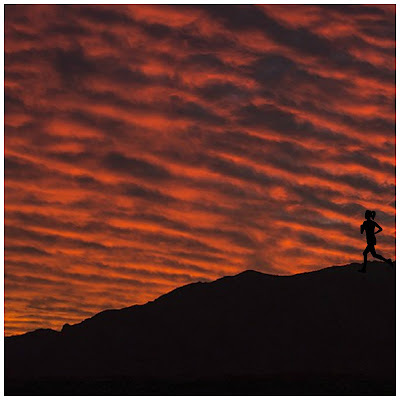 A picture of the Inca: When we get to the Incas, I love to incorporate some videos. Watchmojo has a short video on 5 important facts about the Inca and their success as a civilization. Similarly to the comparative timeline of the Aztecs, there are some surprises here. I like to show the National Geographic Machu Picchu decoded video at lunch. Some times I include the short Horrible Histories Inca video which highlights some of the grossest aspects of the Inca civilization, and lots of students LOVE. I offer the Horrible Histories books not only on the Incredible Inca but also the Angry Aztecs as part of our study. I use highlights from the books for all. Sending a message: One of the most fascinating aspects about the highly successful Inca civilization is that they had no written language. Furthermore, they had large geographic challenges not only in the wide expanse of the empire but also the topography which included valleys, rivers, mountains and ocean. We engage in 3 activities to study the communication system of the Inca: one in partners, one in small groups, and one individually. In the collaborative activity, they physically take on the challenge of sending a message over a large space. It is a hit with students who love to get moving. This kind of simulation cannot be replaced with a video or reading. The students analyze, discuss, inquire and get involved in hands-on learning. ideas. 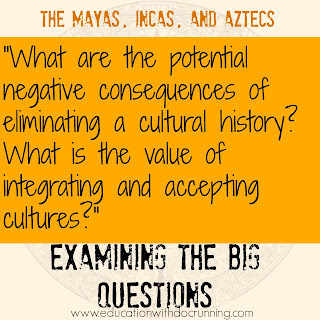 One of our main discussions centers around the big questions: what are the potential negative consequences of eliminating a cultural history? What is the value of integrating and accepting cultures? 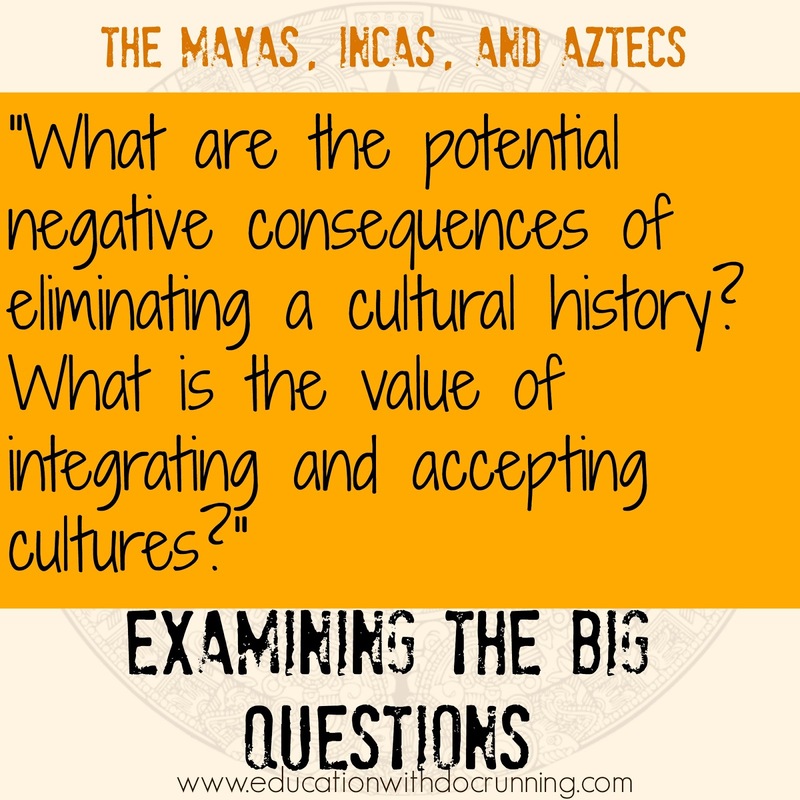 This set of questions refers not only to the Spanish destruction of both the Aztec and Incan cultural pieces but also to big issues that are still faced in modern times. We hold a short series of seminars in which we debate these questions. 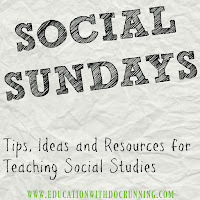 We do much more with these three fascinating cultures, but the above are 8 activities that we love in my class. I hope you find it helpful in designing your own Civilizations of the America unit. Have questions? Post them in the comments section. I'm here to help.